A quite young tigress of zone no.2. She was born in 2011, her name is Chandra. 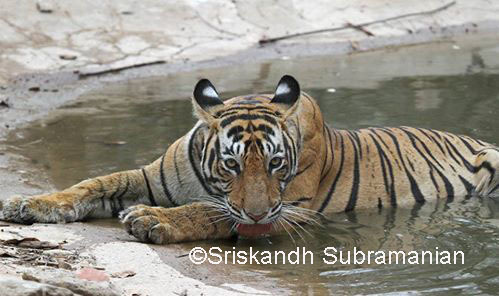 Her mother, T-19 (Krishna) had given her first litter of two males and one female father by T-28 , Star Male. After grew up as sub adults, they had separated from their mother (T-19) in 2013. A tigress, T-63 is one of them and has settled down around in zone 2 from Amrai, Mondok, Chhindali and Phoota-Kot area , while her siblings both brothers,T-64 and T-65 have settle down in their parents territory. 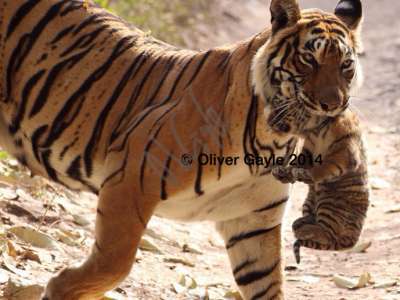 The first litter of T-19 was sighted first time on 26 May 2011 by nature guides, Farid Khan and Saleem in zone no. 2. Now days, we are hoping a good news from her.